Aconcagua meaning “Sentinel of Stone” is situated in the Andes mountain chain which run for over 7000km from the Caribbean to Cape Horn making it the longest mountain range in the world. Aconcagua, is the highest mountain in both the western and southern hemispheres and is the second highest of the “Seven Summits”, standing head and shoulders above all its surrounding neighbours. 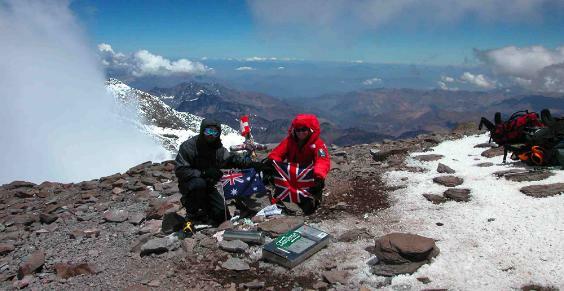 Many mountaineers consider that although Aconcagua is just under 7,000 metres (22,966 feet) in height, the effects of altitude are more comparable to an 8,000 metre peak due to both its latitude and its position with regard to the ozone layer. Being so high, even during the summer months Aconcagua can experience ferocious weather and when lenticular clouds form around the summit this is an indicator of extreme winds. On Aconcagua these are known as the Viento Blanco (White Wind) and with such strong winds a summit attempt would be impossible and foolish to even think about. The mountain is wedge shaped and its South Face is a colossal rock face towering vertically up for 8,000 metres (26,247 feet). However, it is mostly climbed via the Horcones Valley which lies to the east and is the fastest and easiest way to reach the summit. However, this sometimes traps climbers into ascending the mountain too fast and consequently encounter life threatening altitude problems. Despite approximately 3000 people attempting to climb Aconcagua every year, it has disturbingly high death tolls. There are many statistics to support this but on average for every eight people that attempt to climb it, two will summit and one will perish on the mountain. Due to the proximity of Aconcagua’s summit to the Chilean Trench in the Pacific, it is the largest change in altitude in such a short distance anywhere on the earth, amounting to almost 14,000 metres (46,000 feet).